Do you hear that? It’s the call of the wild. Camping in Kissimmee is the best way to make the most of an outdoor Florida adventure. But just like they sing in The Lion King, you need to be prepared! Here’s a quick look at a few of the essentials for a fun Florida camping experience. Sleeping under the stars is a wonderful way to experience Kissimmee, and packing the perfect tent will make your camping trip even better. Make sure to choose a tent with plenty of space, especially when sharing, as well as one with excellent cross-ventilation. Trust us, you’re going to love waking up to that fresh Kissimmee air! A lightweight sleeping bag is important for a good night’s rest in the wild. In addition, consider packing a few extra blankets if you feel like snuggling up when the sun goes down. Everywhere in Kissimmee—from the great outdoors to our great attractions—it’s important to have sunscreen. We recommend a physical sunscreen (that means one that reflects UV rays) with an SPF rating of 35 to make sure you’re always covered and comfortable. Remember to reapply every two hours, and when going swimming, choose a sunscreen that is water-resistant. All the fun of a camping trip is sure to work up an appetite, so remember to pack a camp stove. A simple propane stove will do—and make you the envy of other campers. Plus, with extra utensils (think stainless-steel forks, knives, and spoons, plus enamel plates and cups), you can invite fellow campers over to share a meal. This sounds like the start of a beautiful friendship to us! When the sun goes down in the wild, the moon isn’t always enough to light the way which is why flashlights are key. Whether you want to stay up late into the night with that page-turner or take a stroll over to another campsite, a flashlight will help you navigate through the dark safely and easily. Also, they’re an excellent tool for telling spooky stories. While flashlights are a must for making your way around in the dark, lanterns are great for sitting around the campsite and enjoying an evening under the stars. If the lantern is battery-powered, you can even bring it in the tent for a little late-night planning for the next day’s adventures. You know what they say, when nature calls, make sure you have toiletries. Remember to pack your toothbrush, toothpaste, and soap, as well as toilet paper and hand sanitizer. Some folks like to grow a beard when they’re out in the wild, but if you prefer a shave, take a disposable razor along as well. When camping, we always say it’s better to be safe than scratchy. Bug spray is a camping essential anywhere you go. It will keep you comfortable outside, and make unwanted campsite buzz off. Even when camping, you can still use gadgets and gizmos—just remember to bring an extra charge. Batteries are a good option, as are solar power banks. Easy-to-use, solar power banks charge while you’re out having fun in the Kissimmee sun and offer the perfect boost to keep you connected via your smart devices. Kick your feet up and relax around the campsite (this is a vacation, after all) by bringing camping chairs along for the journey. A comfy camping chair is ideal for enjoying a meal with your fellow campers, or simply for taking in the sights, sounds, and smells of Florida nature. In addition, remember to pack destination-specific items. Is the campsite near a lake? Then fishing gear is a must. Is there a pool? Be sure to pack those swimsuits. 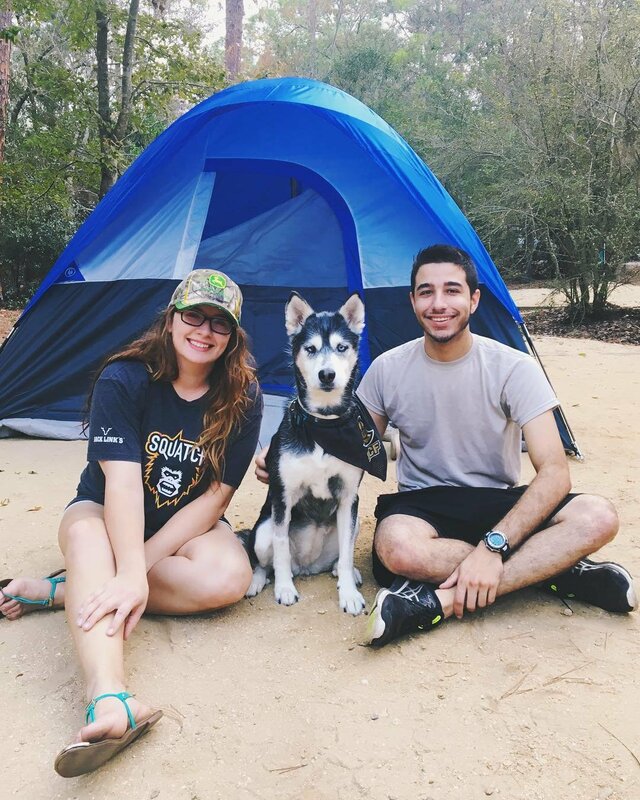 Recently, we put together a list of our favorite spots to set up camp in Kissimmee, so check it out for a little outdoor inspiration. To learn more about what to bring, where to go, and things to do when you visit us, be sure to subscribe to our newsletter.